The benefits of dancing for children are significant. Kids and teenagers quickly develop self-esteem, respect for themselves and others, poise, confidence, excellent posture, style and inner-discipline; traits that will serve them for a lifetime. UCan2 have been providing programmes in schools since 1993, working with students from Year 1 to Year 13. At each stage in their development, children's abilities and needs change therefore we have developed age-appropriate teaching methods and dances based on the natural progression of the body's movements, posture and mechanics. Our programme has been developed to start younger children off with simple and fun non-partner dances but gradually working towards the more popular social dances of Ballroom and Latin including fun Line Dances and much more. Once a student experiences the benefit of learning these timeless dances, the skills will stay with them for life. We would love the opportunity to discuss all our teaching methods, dances and experience with you in person, so please please contact us by email for more information. Your school could be this year's winner! Medal classes are for those who wish to learn at a more technical level than in the 'social classes'. A minimum of two terms are required in preparation for the test. You may join this class only at the beginning of terms 1 & 3 and Medal Tests are held at the end of terms 2 & 4. Participation in all Dancesport Classes and Sunday Practice Session are included in the term fee. Course: It takes two terms to prepare for each of these Advanced Medals, so you need to join the class at the beginning of Term 1 or Term 3. The Medal Tests are at the end of Term 2 and Term 4. Cost: Term fee only - no casual rate - and payable before commencement. No classes in holidays unless especially scheduled. Bonus: Medal class members may join Social classes at no charge during term time only. During school holidays a casual rate would apply. Medal Class Levels: Please refer to the Medal Programme page for more detailed information about Medal Classes. Technique is so important, so this technical training group class ensures a good foundation for your child's dancing future and is a stepping stone to competition work. Cost: A combination special with your Medal Class term fee is the best option, but a casual fee is also possible. NB: This class is included at no extra charge for Training Squad members. By invitation only, the Training Squad is an in-depth technical training in Ballroom and Latin American. It is designed for competition dancers and those at high medal levels. Cost: Term fee only and payable before commencement. Training Squad Details: Please refer to the Competition Training page for more detailed information about our Training Squad. Beginner dancer, mall groups, medal training, improving your technique, or competition training; whatever your reason, private lessons bring confidence, enjoyment and enhance your skills. Private lessons are available from 4.00pm (earlier by special arrangement) to 9.30pm Monday to Friday, with Saturday mornings and Sunday afternoons by appointment only. Important: We require 24 hours notice of cancellation or postponement of a private lesson, otherwise the full fee will be charged. If you are not prepared to accept this condition, please do not book a private lesson. Our coaches are all heavily booked and can't be left standing when there would be others who would like that time. Below you'll find answers to the questions we get asked the most often about our dance classes. If you're question's not listed, then please ask us - as others may benefit from your question too! Do we have to change partners? What should I wear and do I need dance shoes? What if I haven't done any dancing before? When does a new course start? "Where do I start?" and "Where do I go from here?!" Do you offer special deals on multiple courses? How can I pay for my classes? Do you have a brochure for more information? No. Both ladies and gentlemen often come to our dance classes on their own. During our classes, you will be asked to partner up with another student; we also change partners during the class. 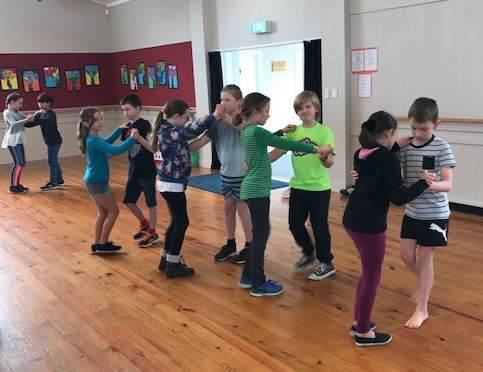 If there are insufficient partner numbers in the class, then occasionally you may need to dance without a partner for a single music track, while available partners rotate around the class. Not if you really don't want to! An important part of learning to dance is learning to 'drive a new model'. However, if you prefer, you may stay together. Wear something comfortable - you are likely to get a bit hot. Shoes that stay on your feet are all that's required at Beginner level. That's what our Beginners course is for. The classes are aimed at those who have never danced before. Find out more about our range of dance classes. Our Ballroom & Latin American and Street Latin courses all start the 1st week of each month (excluding December), so you will never have to wait long before joining a new course. You are welcome to come and view a class from our mezzanine if you would like, before joining on the first week of the month. Adult Beginners Ballroom & Latin American commences the 1st Wednesday of each month (excluding December when there are no classes). Adult Improvers Ballroom & Latin American commences the 1st Wednesday of each month (excluding December when there are no classes). Adult Intermediate Ballroom & Latin American commences the 1st Thursday of each month (excluding December when there are no classes). Adult Beginners Street Latin commences the 1st Tuesday of each month (excluding December when there are no classes). Adult Improvers Street Latin commences the 1st Tuesday of each month (excluding December when there are no classes). To give you an opportunity to 'try before you buy' at Beginners, Improvers and Intermediate levels, we have scheduled some Free Introductory nights through the year. This is a great chance to try out a class before committing to a whole course. There is no obligation - just turn up and enjoy a class. 10% discount if you sign up on the night. Check our Free Class Calendar for the next Free Intro Classes. For an explanation of the levels available to dancers who may want to progress from Beginners to a Medal or Competition Dancers, check out Dance Class Styles. Don't panic, it's a natural progression ... and we'll be with you all the way. In our Beginner Ballroom & Latin American dance course, you learn the basic steps to: Cha Cha Cha, Samba, Rock 'n Roll, Foxtrot, Quickstep, and Waltz. Note: You may repeat this course as often as you like - without paying any extra - for 12 months from the date of your registration. In our Beginner Street Latin dance course, you learn the basic steps to: Salsa, Bachata, Merengue, and Argentine Tango. Note: You may repeat this course as often as you like - without paying any extra - for 12 months from the date of your registration. When you feel you are confident with all the steps taught at Beginner level, you are welcome to join our Improver Ballroom & Latin American dance course and/or Improver Street Latin dance course. In these classes, you will continue learning more adventurous steps in the dances taught at Beginner level. Note: You may repeat your respective Improver course as often as you like - without paying any extra - for 6 months from the date of your registration. This is where the fun begins! In our Intermediate Ballroom & Latin American dance course, you learn: Tango, Rumba, Jive, Viennese Waltz and Slow Foxtrot. Moving on up - for those whom would like to learn more! In our New Vogue dance course you learn: New Vogue Waltzes, Foxtrots, Tangos and Marches. Our Adult Medal Classes and Kids & Teens Medal Classes are for those whom wish to learn at a more technical level than in the 'Social classes'. At this level, you are required to sit a test. Our Adult Training Squad and Kids & Teens Training Squad are by invitation only. This includes an in-depth technical training in Ballroom & Latin American and is for competition dancers and high medal levels. Please refer to the Competition Training page for further details. Yes we do. Please refer to the "2 Course Special" and "2 Course Membership Special" offers under the respective dance classes of interest (eg. Adult Dance Classes or Kids & Teens Dance Classes). We accept cash, Eftpos, Visa and MasterCard credit and debit cards for your convenience. Yes we do. You can download our UCan2 Dance Classes, Schedule & Prices brochure.